"Tried this at a country music festival and loved it! Easy, a little messy, but oh so worth it! Eat whole, all at once. This will seem like quite the mouthful, but will taste amazing! Enjoy." 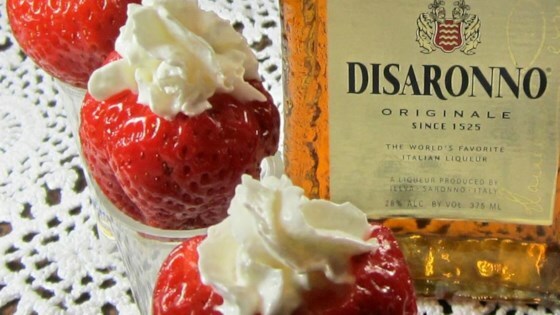 Pour amaretto liqueur into each strawberry and top with whipped cream. Ripe strawberries filled with amaretto and whipped cream. I submitted this. Just wanted to share that you have to put the whole strawberry in your mouth at once. It will seem like a mouthful, but it's the only way! Enjoy! Super simple. I like simple. Made with Frangelico for adults and chocolate sauce for the kids. These are amazing ~ Cheers! Easy to make and everyone LOVED them...yum??!! !